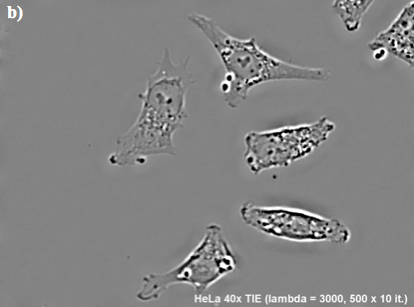 In this work, we consider the problem of imaging transparent (phase-only) objects by using a brightfield microscope. Our approach is built on the Transport of Intensity Equation (TIE) that relates the intensity of a scattered field to its phase distribution. We introduce two different solutions of the TIE, namely Tikhonov and Total Variation (TV) regularization and propose two different implementation of the TV regularization, namely IRLS and FISTA. We confirm the ability of the TV regularization to retrieve sharper images with a better contrast. Also, we observe that the computation time of the FISTA is significantly shorter than IRLS. We investigate the effect of the algorithm parameters with simulated data and we validate its applicability on real data. 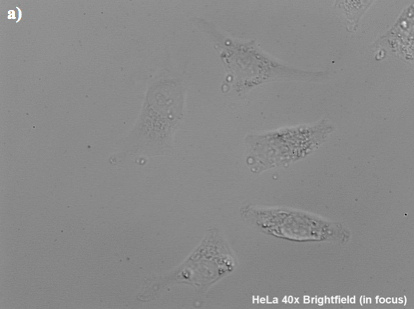 Figure 1	HeLa cells at 40x magnification. a) brightfield image in focus and b) TIE phase reconstruction.